The TI-1795SV looks great - you won't find any right angle in the design. Curious about the SV letters ? It is the abbreviation of "(SuperViewTM)." which implies the perfect reading of the LC-Display. Compare it with the predecessor TI-1795+ or the TI-508. A more or less identical calculator with 10 digits of display capability was introduced with the TI-1796SV. A similar shaped housing was used with the €-1796 introduced in the same year. Not yet verified is the date of introduction of a real twin - the odd TI-7350SV. 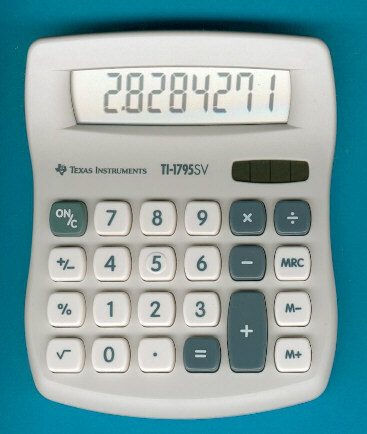 The TI-1795SV was in 2003 the only calculator that received even a technical enhancement with new tax functionality.